Avra Valley near Tucson in March 1941. Botanist J.J. Thornber standing in a huge field of Mexican gold poppies (Eschscholtzia mexicana). This habitat is actually the extreme eastern edge of the Lower Colorado River Valley subdivision. The surrounding hills are Arizona Upland. There is poor documentation for the years between 1941 and 1964. William McGinnies of the University of Arizonas Desert Laboratory was an avid wildflower watcher. Though he was not in Tucson for the entire period, he did not remember any great wildflower blooms in the area between 1941 and 1978. 1965 1.69 1.15 1.25 1.22 0.89 1.01 0.42 7.63 FAIR? 1966 0.87 0.03 0.86 7.27 1.95 2.79 0.14 13.91 GOOD? 1968 1.03 1.26 0.70 5.71 0.43 1.73 2.19 13.05 GREAT? 1973 0.83 4.82 1.59 0.23 0.03 1.54 3.98 13.02 GREAT? 1978 0.20 2.90 0.28 1.92 2.43 1.70 1.65 11.08 GREAT? 1978 0.33 1.21 0 1.38 1.42 1.38 1.57 7.29 GOOD? Along I-8 near Gila Bend AZ. Wildflower displays in Organ Pipe Cactus National Monument - poppies, lupines, owl clover, brittlebush, and phacelia. Field of annual globemallow (Sphaeralcea cf. coulteri) on the Tohono Oodham Indian Reservation west of Tucson. This site is in the eastern edge of the Lower Colorado River Valley subdivision. 1984 5.76 5.61 1.49 0.98 0.55 0.00 0.00 14.39 FAIR? 1986 1.55 0.75 1.12 0.29 0.73 1.74 1.57 7.75 FAIR? 1991 2.51 0.54 0.46 3.31 1.50 0.87 1.81 11.00 FAIR? 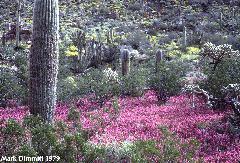 While there were few annuals in 1995, brittlebush put on its best show in years in the Tucson Mountains. 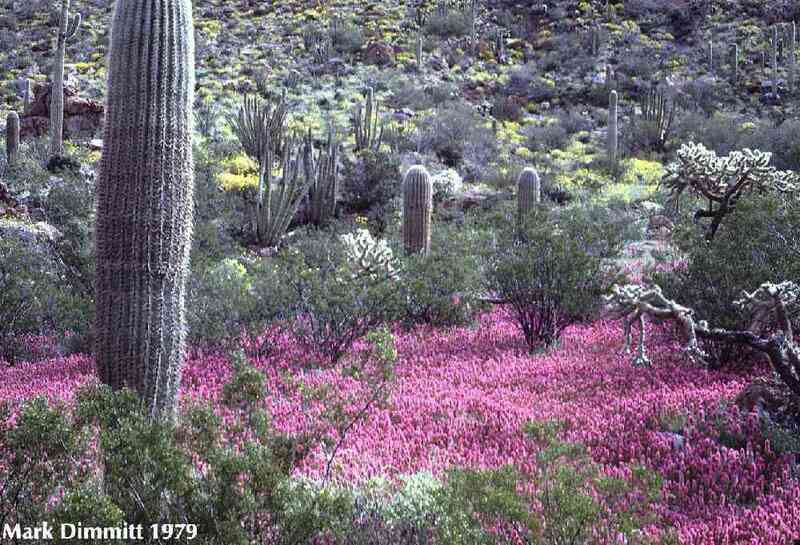 Spectacular nearly everywhere else in the Sonoran and Mohave deserts, the bloom from Organ Pipe east to Tucson was less than great in 1998. It certainly seemed fantastic after 19 years of mostly poor showings, but photos of past blooms are better than our memories. Annuals were not abundant around Tucson, but Calochortus kennedyi (desert mariposa) and Delphinium scaposum put on their best show in 20 years. These photos were taken in King Canyon near the Desert Museum. Organ Pipe Cactus National Monument put on a beautiful show, but it was pale in comparison to 1978 and 1979. Hurricane Nora got the seedlings started, but dry spells in November and January probably stunted their growth. Eschscholtzia mexicana (Mexican gold poppy) and Castilleja exserta (owl clover). This was one of the few large patches of poppies this year. A field of Phacelia crenulata (caterpillar weed). This species was a dominant in 1998. A mass of a species of small white composite with a few owl clover. Castilleja exserta (=Orthocarpus purpurascens, owl clover) was very rare in 1998. Compare with 1979 when it was a dominant part of the show. One of the few good patches of owl clover in 1998. While Organ Pipe Cactus NM was only good in 1998 compared to 1979, nearby Coffeepot Mountain just east of Ajo was spectacular. It must have received more rain at a crucial time. Since its off the beaten track, few people witnessed its glory. There are too many species of annuals in these two images to list; how many can you distinguish? This massive display was on the San Carlos Indian Reservation northeast of Phoenix. See more great images of the desert Southwest and other areas at the Ramblin' Cameras website.